With a six cylinder engine and a five-speed stick, today’s Nice Price or Crack Pipe Mercedes R129 is a rare bird indeed. We’ll have to decide if this lower-spec’d roadster’s price make you want to flip it the bird as well. When you think “King of the Hill” do you envision yesterday’s 1990 Chevy Corvette ZR1, hubristically anointed as such by its originators? Or, do you envision Mike Judge’s animated propane and propane accessories salesman, the ever defeatist Hank Hill? Either way, it’s all good, but we’re here to talk cars so let’s focus on that ‘Vette. At 375 horsepower, the ZR1 was the pinnacle of performance in the C4 Corvette lineup, and at $11,500, yesterday’s somewhat mile-heavy example is now one of the cheapest around. Lacking any major cautions, that worked in its favor, and it came across the finish line with a laudable 67-percent Nice Price win. How noble! King in German is König which is the name of Willy König, founder of Koenig Specials GmbH. As we all know, that was the noted German automotive tuner of the ‘70s, ‘80s, and ‘90s that took top editions of performance models and imbued them with even more performance. Of course, if there’s a king, there must be a commoner, that’s just how things work. In the case of today’s 1991 Mercedes Benz 300SL, being a commoner doesn’t make it all that common. This is however, the sort of entry-level car that Koenig would have passed right on over. The 300SL’s 228-horsepower/201 lb ft of torque DOHC six would prove to be far less popular here in the States than would the 302-horse V8. Six cylinder R129s would be dropped here entirely in ’98, leaving only the five-litre V8 and six litre V12 cars to carry the torch. Okay, so this is the bottom of the barrel SL, why would I want that? Well, one thing the six offered that was unavailable with the larger mills was a manual transmission, and that’s just what this car carries—a Getrag five speed. Now, this gearbox is neither the smoothest nor sportiest to shift but it will get the job done and offers a level of uniqueness for this car that elevates its position as a curiosity. The six is also about 200 pounds lighter than its bigger brethren, and in a car tipping close to two tons, every little bit helps. Overall, the car looks to be in seemingly decent condition, but the ad does note it to be: ‘Not a perfect car, but a driver, roadster that has seen some use and has a lot of life left’. Mileage is a mama bear middling 151K and there’s two major issues visually on the car. The first is a front bumper that looks to be primered black. Yeah the rest of the car is black, but the finish sticks out like a sore schnitzle. The second issue is the presence of chrome wheels. The ad makes no mention of what’s going on with the bumper, but does happen to call out those wheels. Those wheels are an easy, if not exactly cheap fix, but painting that front bumper the appropriate shiny black will likely be even pricier. The rest of the body presents as straight and without major issues. These cars also come with that hypnotizing articulating single wiper which might alone be worth the price of admission. I love those things! Under the long sloping hood resides the 2962-cc DOHC straight six in a bay that’s about as tidy as you would expect. It’s good enough for selling, but don’t expect to eat dinner in there. The ad notes some major maintenance here, including a new brake master, all the rotors, calipers and pads, clutch and clutch master, water pump, ignition bits and a few more things. The interior looks like a decent place to hang and shift that long-throw five speed. There’s a split in the seam of the driver’s seat, and the electric adjustment on the passenger’s side has given up the ghost, but otherwise it seems to be functional and tidy. A tear in the convertible top may make the included aluminum hard top a mandatory bit of weather protection, but at least it’s still kicking around. The title is said to be clear and the seller claims the car to both be Hagerty insured and priced below book. 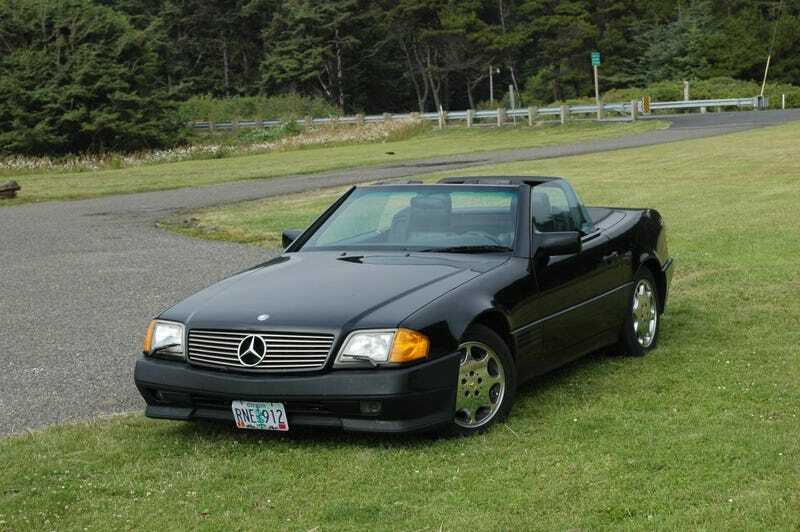 That price is $4,900 and it’s now incumbent upon you to decide if this oddly kitted SL is worth that kind of cash. What do you say, could this 300SL pull $4,900? Or, for that much is this a roadster that’s just seen too much road? Eugene, OR Craigslist, or go here if the ad disappears.